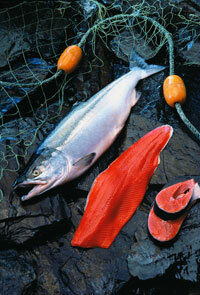 Wild Alaskan Sockeye (Red) Salmon. Recently the US Food & Drug Administration has approved the production and marketing of genetically modified salmon for sale in stores and restaurants in the United States. This marks the first GMO species of fish or animal approved for human consumption in the US. This approval highlights the importance of insisting on wild salmon when you eat-out or buy fish to cook at home. For years the name Atlantic salmon has been synonymous with farm-raised fish. These fish, reared in tightly crowed net-pens offer few of the amazing health benefits found in their wild counterparts. Now, with the advent of genetically modified Atlantic salmon, aptly dubbed “Frankenfish”, consumers need to be ever vigilant to ensure the fish they choose is wild Alaskan salmon. Genetically engineered salmon, developed by AquaBounty Technologies of Maynard, MA, under the trade name AquaAdvantage, combine genes from both Atlantic and Pacific Chinook Salmon along with a growth gene taken from the Ocean Pout. This enables the GM Salmon to grow year-round, where native salmon species exhibit high growth rates in the summer months with slower growth during the winter. Thus, the engineered fish achieve marketable size in less than half the time required by wild salmon or even traditionally farmed fish. As consumers we must be aware that these fish are on the market and may be lurking in the seafood department of the local supermarket or in the kitchen of our favorite eateries. Labeling requirements by the FDA do not require distinction between farmed salmon and this newly created offshoot. So, if you are buying Atlantic Salmon it is possible you are getting the altered version without even knowing! The only way to be sure of what you are eating is by insisting that your salmon is wild-harvested from Alaskan waters. In Alaska you will find five wild varieties of salmon – Chinook (king), Sockeye (red), Coho (silver), Pink (Humpy), and Chum (keta). While pinks comprise the largest Alaska harvest overall, they are generally considered to be of lesser quality and, as such, are used primarily for canning and smoking. The Chinook and Sockeye are considered by most as the best table fare and are found as featured entrées at fine restaurants and are for sale in stores (and online) as fresh/frozen wild salmon fillets. Coho are prized by local sport fishermen for their energy and exuberance at the end of a line and are also fine table fare but comprise a relatively small commercial harvest. 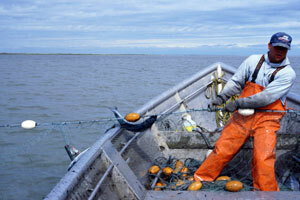 A commercial salmon fisherman pull his net. All of these species grow naturally, swimming hundreds, if not thousands of miles in the open ocean. This builds lean muscle mass with concentrations of healthy Omega 3 fats, for which wild salmon is so highly regarded. Living in the open ocean these fish feed on natural organisms such as krill, shrimp, sand lance, and herring. This feed is what gives the ocean-run salmon its rich pinkish-orange color – color that is added as a dye in farmed salmon. As consumers, it is our burden to ensure we know the source of the food we eat. Sometimes misleading names and deceptive labeling practices make this a challenge. Now, with the creation of modified species, it is more important than ever to take the time to find out where our seafood is sourced. Insist that the salmon you eat is wild, natural, and sustainably harvested from clean waters. Insist on wild salmon from Alaska!